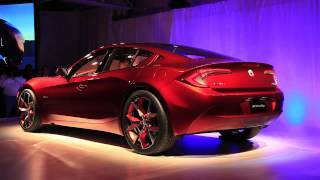 During the ongoing New York Auto Show Fisker officially revealed the brand new Atlantic Concept, a four door luxury sedan powered by an electric motor. Fisker claims that the Atlantic strives to be a safe, practical and impactful sedan aimed towards both dynamic and responsible young families. 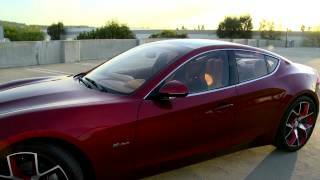 The Fisker Atlantic Concept makes use by the latest EVer technology (Electric Vehicle with extended range) and Fisker claims that the Atlantic will make sure to eliminate the "range anxiety" given by other all-electric powered cars. To do so, the Fisker Atlantic will be equipped with an electric motor which will send its power to the rear-wheels, and a secondary four-cylinder gasoline engine provided by BMW which will not be mechanically connected to the wheels but will act as a generator for the electric motor. 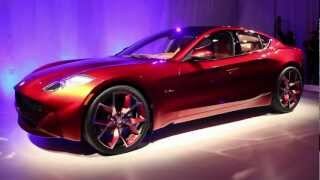 In other words, the Fisker Atlantic will be a combination between an all-electric and a hybrid car. We should also point out that an all-wheel drive variant will be made available in the future. The Fisker Atlantic Concept boasts a high level of safety and according to Fisker engineers, the Atlantic features what they call "spider structure", and an advanced roll cage that offers generous headroom for the rear seat passengers. The Fisker Atlantic Concept is roughly the size of an Audi A5 and offers a dynamic and compact feel. 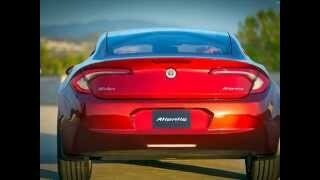 The exterior design shares some similarities with the Fisker Karma, mostly when it comes to the signature grille. Other interesting features include the rear door handles which are integrated within the rear C-pillars, resulting in a sedan with a strong resemblance to a coupe. The Fisker Atlantic features an all-glass roof for an open feel, and the rear end of the car has been shaped in an aerodynamically manner, featuring a sharp spoiler lip which runs down over the side of the car. As far as availability goes, Fisker has not yet revealed the date on which the Fisker Atlantic Concept will become a production car but as far as pricing goes, Henrik Fisker mentioned that the Atlantic will fit somewhere at the "upper end of the BMW 3 Series range". 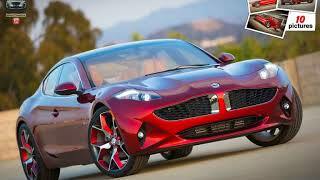 In other words, the Fisker Atlantic will most than likely cost roughly $60,000. That being said, the Fisker Atlantic will probably be a strong competitor to the Tesla Model S which costs around $50,000 or $60,000 for the 40 KWs and 60 KWs variant respectively, and $70,000 for the 85 KWs model.